If your child goes missing, time is of the essence! If your child is abducted, there is a 74% chance they will be killed in the first four hours and 95% within 24 hours. That is why it is so important to have our service before this happens to you. With your child’s information securely stored, our call center can act quickly to create and distribute information to mass numbers to begin the recovery process. We have a 100% recovery rate for those registered with us before they went missing, so this is a key element of quicker recovery. Average time for law enforcement to gather, verify and distribute information is 7 hours! Average time for Call Alert Center to gather and distribute information is 7 minutes! Don&apos;t be fooled by simply having an ID kit for your child. That is strictly identification tool, not a recovery one. Have you ever seen a missing poster of a fingerprint or DNA strand? That is because those kits are used for identification and usually in the worst of scenarios. Our registration process is easy, just have all the information and photos of your child or children available to complete the process. You can login any time with edits and updates at no charge. An estimated 90% of parents assume every missing child qualifies for an Amber Alert, yet less than .0004% actually do. While that statistic is astounding, we believe it is important for you to know. Two main criterias for an Amber Alert are to have a description of the person who took your child or a description of the auto they were taken in. If you don’t qualify, then you must work with local law enforcement to start the process and that can be time consuming. 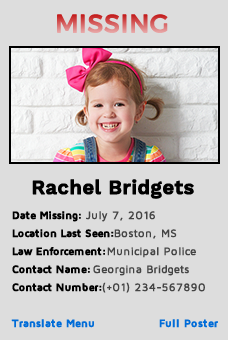 We create a mini-missing poster with PHOTOS with our text link, not just abbreviated text like an Amber Alert and that is a significant difference. I was so worried that my daughter, Rachel would not return to my arms again. Thanks to CAC’s Child Alert Center Service, they were able to help me and find my daughter back at home. I thank all the people who have helped in searching for my baby. Thank you so much for returning my daughter back.